Mahama, Stop the Insults, Dance and Whistles. Read and Speak to facts. – Democracy Watchers – NPP USA Inc.
Democracy Watchers, a Public Policy oriented group has called on Former President Mahama to desist from a campaign of insults as election 2020 approaches. The group says Mr Mahama should instead focus on paying attention to facts and not emotions barely two years after he lost power. The former President who has announced an intention to re-run for the Presidency and correct his mistakes has since the launch of his campaign, made comments that have raised eyebrows among observers of Ghana’s democracy. The group which is worried about this trend on Tuesday admonished the former President to drop the Unbecoming posture and behave as a statesman. Mr Mahama was reported a week ago as terming the Free SHS and Double track programs as senseless. Speaking on his campaign tour in central region, Mr Mahama promised to review the program because in his opinion it did not make sense. On Tuesday morning, the office of Mr Mahama issued a statement claiming the Vice President of the Republic had ‘lost his presence of mind’. “At Democracy Watchers we are scandalized that a former President will use such language especially on public platforms. Again we are disturbed that the Former President right from the onset of his campaign does not seem to have moved away from conjecture, jokes, insults and name-calling. We think this same attitude of Dancing and whistling and focusing on catchy phrases contributed to perception that Mr Mahama is incompetent and unfocused as at the time when Ghana needs critical minds to tackle her problems. We call on Mr Mahama to as a matter of urgency realize that these did not help him in the Past and will certainly not help his campaign at this stage. Instead he should focus on reading, sticking to facts and convincing Ghanaians that there was a genuine reason for which his administration failed to bring relief to Ghanaians when given the opportunity.” A statement released by the group said. The statement further intimated that if Mr Mahama were to focus, read and attend to facts, he perhaps may be able to convince his former appointees some of who held very senior positions in his administration, to quit campaigning against him, believe in his candidature and support his comeback efforts. 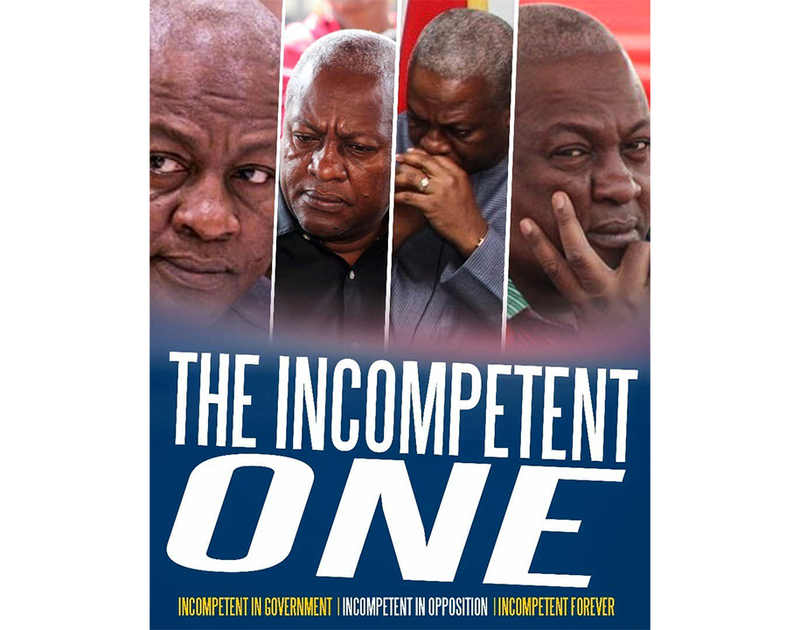 Mr Mahama has been variously perceived as unserious with about 12 of his former appointees contesting him in the NDCs upcoming polls and openly questioning his fitness to lead. While some of his former appointees cite personal vices as reasons for his seeming playful attitude, party insiders are worried that frequent sights of him riding motorbikes, singing in Parks in Kenya and casting insults at Political opponents do not inspire confidence that he has learnt any lessons from his 2016 defeat. Mr Mahama lost the 2016 Presidential elections to the NPP’s Akufo-Addo. Corruption and incompetence were sighted as major reasons for which he was rejected by the electorate. Mr Mahama who presided over numerous corrupt activities has launched his come back bid with unwarranted attacks on government policies.